(CNSNews.com) – Iranian forces have launched naval exercises in the Persian Gulf – following veiled threats to oil shipments through the crucial waterway – and the U.S. military says it is keeping a close eye on the situation. The development comes amid heightened tensions between Washington and Tehran, and with senior regime officials warning that U.S. attempts to cut off Iranian oil exports as part of a broader pressure campaign will not leave other oil supplies through the Gulf unscathed. “We are aware of the increase in Iranian naval operations within the Arabian Gulf, Strait of Hormuz and Gulf of Oman,” said U.S. Central Command spokesman Navy Capt. Bill Urban in a statement. U.S. officials told wire services that possibly more than 100 vessels are involved, including many small attack boats. Early this week Iranian navy commander Rear Admiral Hossein Khanzadi announced that preparations were underway for “major naval drills,” although he said they would be held late in the fall. In response, officials including President Hassan Rouhani and senior Islamic Revolutionary Guard Corps (IRGC) officers have hinted that Iran would respond by making the Gulf and its Strait of Hormuz chokepoint unsafe for oil tankers. “Cruel sanctions against Iran will leave an impact on the performance of the Strait of Hormuz and we should know that the decisions made in the international environment will not affect just one country,” Khanzadi told reporters in Tehran this week. About 30 percent of the world’s daily seaborne-traded crude oil traverses Hormuz en route to markets in Asia and the West, according to the Energy Information Administration. The strait, located between Iran, Oman and the United Arab Emirates, is 21 miles across at its narrowest point. Tankers use two-mile wide channels in each direction, sailing through Iranian and Omani territorial waters – exercising their right of “innocent passage” under the U.N. Convention on the Law of the Sea. About 1,300 miles to the southwest lies another maritime chokepoint, the Bab el-Mandeb, where developments in recent days have highlighted the threat Iran could pose to shipping. Located between Djibouti and Yemen, the 18 mile-wide strait guards the mouth to the Red Sea, plied by ships heading to or from Saudi Arabia’s western coast, Jordan and Israel, and the Suez Canal and beyond. The EIA says 4.8 million barrels a day of crude and refined petroleum products moved through the strait in 2016. Last week Iranian-backed Houthi rebels fighting in Yemen against a Saudi-led coalition attacked two Saudi tankers in the Bab el-Mandeb, prompting the kingdom’s oil company to announce a temporary suspension of oil shipments through the channel. Iran’s Navy and IRGC forces have harassed U.S. Navy vessels in the Gulf in the past, although this year marked a decline in the number of incidents. Mattis said he could not account for drop in the number of incidents, which seemed out of step with Iran’s belligerent activities elsewhere. Mattis noted that the U.S. 5th Fleet – based in Bahrain, around 300 miles to the west of Hormuz – is a combined fleet, comprising not just U.S. Navy ships but also those from Western and Arab partners. 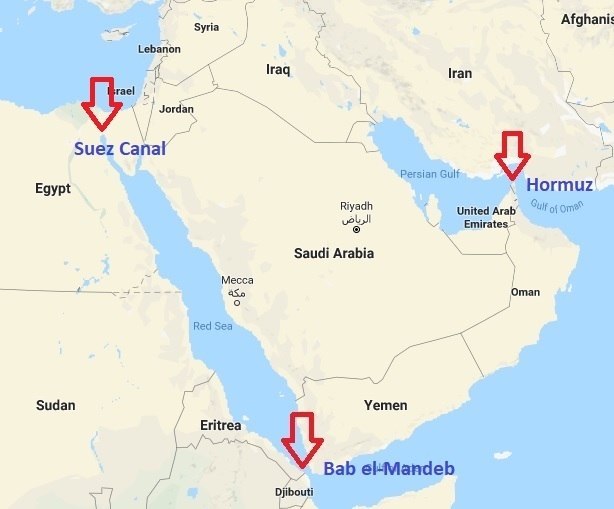 Meanwhile, Israeli Prime Minister Binyamin Netanyahu warned Wednesday that any threat by Iran to shipping in the Bab el-Mandeb – including vessels headed to and from the Israeli southern port of Eilat – would see the Israeli military join others to respond.